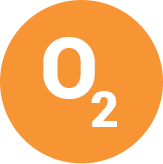 Need compressed oxygen gas and liquid oxygen (O2) in a variety of purities and concentrations? For smaller, more specialized applications contact WestAir for oxygen in high-pressure gas cylinders and liquid oxygen dewars in a variety of sizes. WestAir can also supply bulk liquid and gas oxygen in a full range of purities and tank sizes, for your oxygen needs. Please see the table below for information and to access safety data sheets on liquid oxygen and oxygen gas available from WestAir.